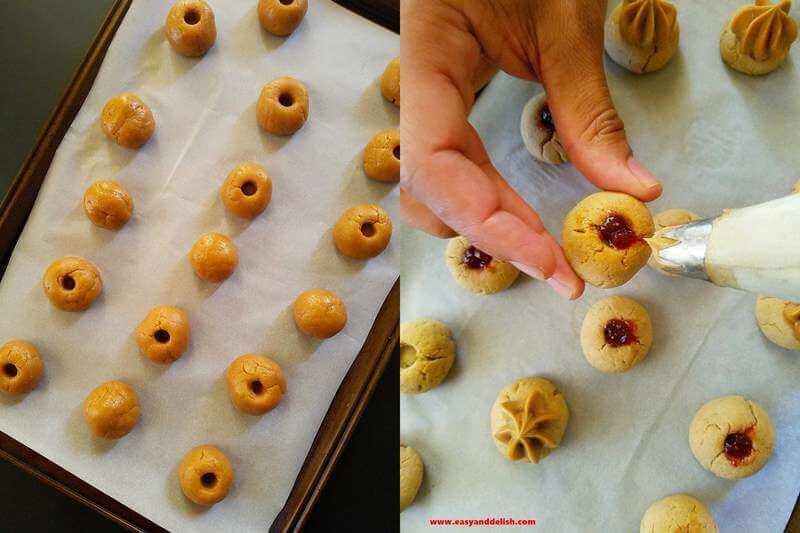 4-Ingredient, Sugar-free Peanut Butter and Jelly Cookies made from peanut butter, an egg, flour, and jelly. They are small and can be prepared and baked in less than 30 minutes. I am a fan of every and anything PB & J. How about you? 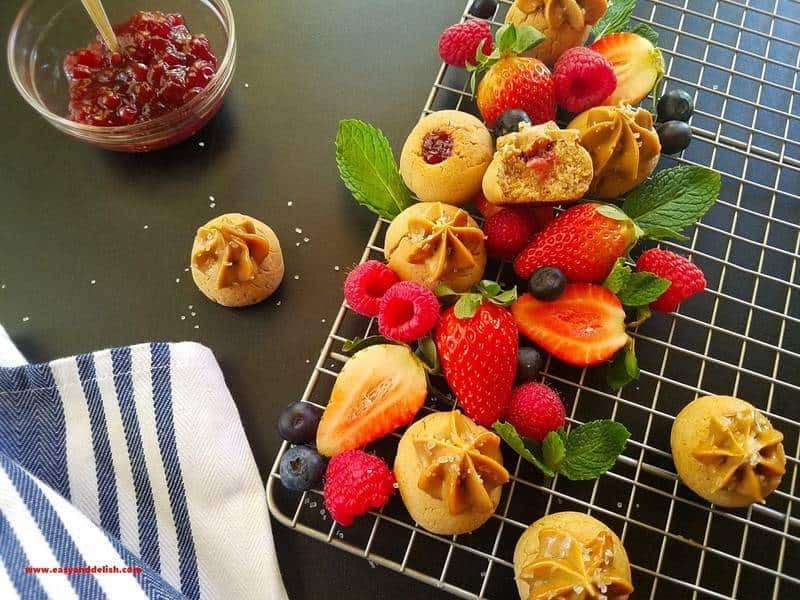 If you are too, don’t miss out on the chance to try these 4-Ingredient, Sugar-free Peanut Butter and Jelly Cookies. They are small and can be easily prepared and baked in less than 30 minutes. They scream party… in your mouth! To make a batch of these, combine peanut butter, an egg, and all-purpose flour together. Roll into balls, make a small hole in the center, spoon in a bit of jelly, and bake them at 350 F for about 8 minutes. Easy peasy, right? 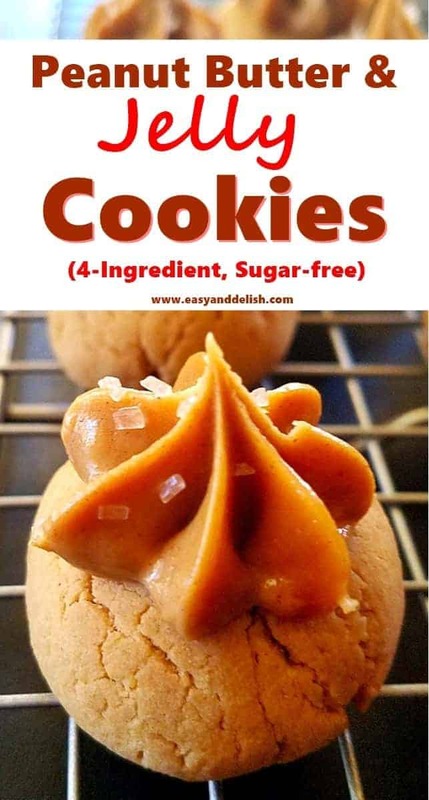 Once they have cooled, pipe a bit of peanut butter on top of each and devour them… while sipping your fave beverage. It is the type of recipe that even a child can prepare it… and they are beautiful! Get creative and arrange them with berries for an extra nice dessert table display. In addition, these peanut butter and jelly cookies are so cute and delish that they make great presents to give away as well, and they can also be served at snack time — either at home or at school… just like our Monster Peanut Butter Cheesecake Sandwich Cookies. Now tell me, is there any excuse left for not making them? In a medium bowl, combine the first 3 ingredients until obtaining a homogeneous mixture. 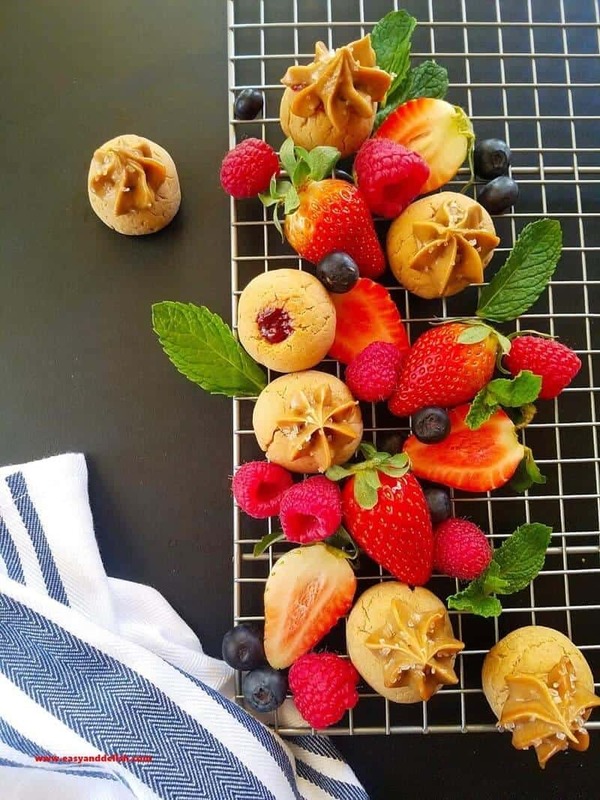 Using a cookie scooper or a tablespoon as measurement, roll dough into balls, place onto the lined baking sheet, and make a hole in the center using the stick of a wooden spoon. Don't poke the hole all the way through-- just more or less halfway deep. Fill each hole with about 1/2 teaspoon of jelly. Bake for about 7-10 minutes or just until cookies set. Transfer baking sheet to a rack and let cookies cool. Then, pipe a bit of peanut butter on top of each cookie. 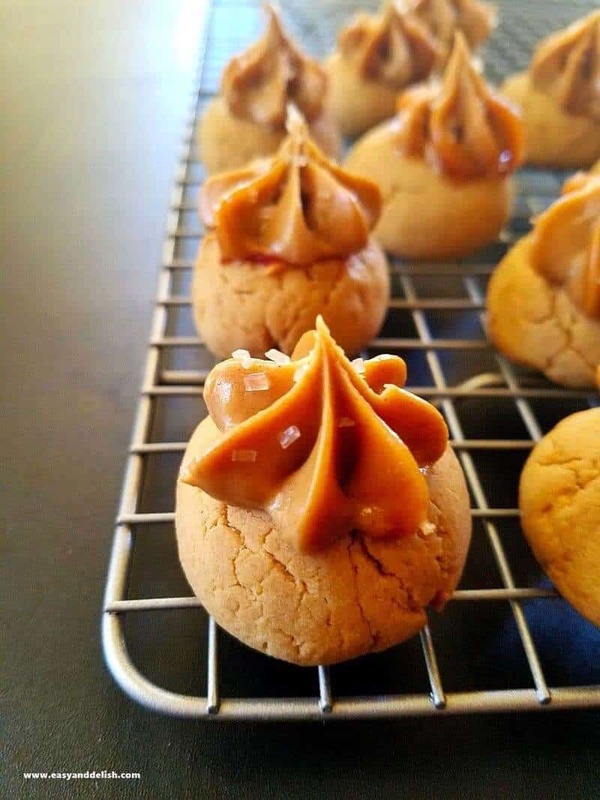 If you are not on a sugar-free diet, you can sprinkle a bit of sugar sprinkles on top of the piped peanut butter if desired. 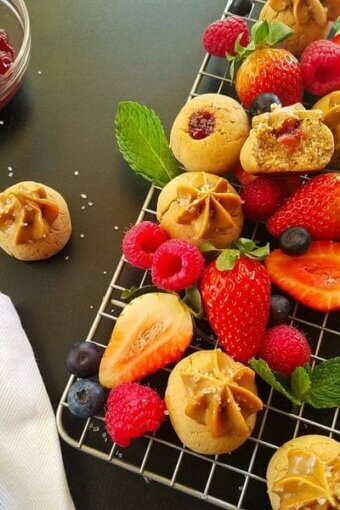 Enjoy these peanut butter and jelly cookies with your favorite beverage. 1. Variations: Use Nutella, cookie butter, or another nut butter instead of peanut butter. If using Nutella, fill the hole with it once cookies bake and have cooled. 2. If you have a sweet tooth, you can add about 1/3 cup sugar or a baking sugar substitute to the dough. Delicious cookies Denise! Plus, they’re very very easy to make! We have some blueberry chunky jam at the pantry which must be fantastic with these:) Thanx so much for another yummy recipe sweetie! These scrumptious cookies evoke the delight of childhood memories! All the sweeter with such an easy recipe! So easy and so pretty, I would love some. 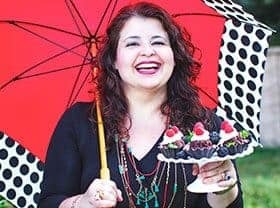 These are some of the most delicious and colorful cookies and dessert ideas I have seen, Denise!